The indicator illuminates when the speed limit control system is enabled by move the lever up on the steering wheel. The indicator goes off when the lever up again to deactivate the system. If there is a problem with the speed limit control system, the “---” indicator will blink. If this occurs, we recommend that the system be checked by an authorized Kia dealer. For more details, refer to “Speed limit control system” in chapter 5. 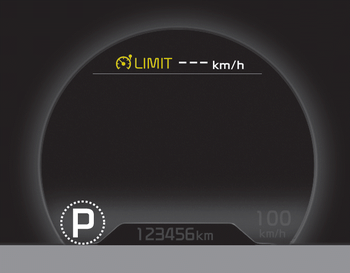 The speed limiter indicators illuminates on the LCD display.